Ringabella is an easy to use, advanced Ringtone designer with it’s responsive interface, amazing speed, real wave analysis, WebDAV, Internet Browser support and more! Create a cheerful ringtone and smile before answering every incoming phone call! 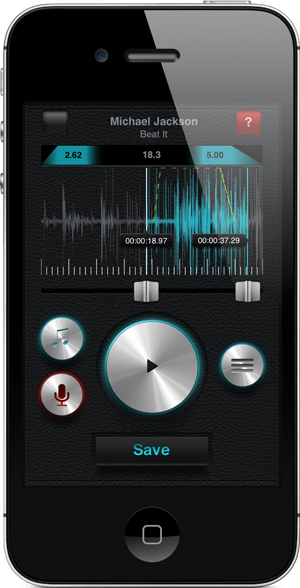 Create beautiful ringtones with the music in your iPod or use your microphone to capture and edit any sound you hear. You can learn Ringabella in the blink of an eye with the quick introduction tour. Just touch to the question mark and let Ringabella explain itself to you. Re-editing original. When you want to reedit the original version of the ringtone you created before, Ringabella will open the source, seek to the related part, adjust the selection area to reflect the same position in the previous record! Real Waveform analysis without blocking your usage. Ringabella will not freeze or make you wait for analysis. It can easily handle very long music data. Unmatched dynamic help system which will explain the functions on the screen immediately. WebDAV support! Link Ringabella to your computer as a folder! Internet Browser support! Connect from your computer to Ringabella with your favorite internet browser! You can also use iTunes File sharing or email your ringtone to yourself. Listing of previously created ringtones, quick preview of them and various actions related to these ringtones. Ability to rename your ringtones. Ringabella will keep your editing safe by preventing any accidental touches those can reset the editing area. Ringabella is brought to you by the creators of RADYO, the most advanced radio entertainment application in the galaxy. We value any feedback. Please remember that we cannot reply to your comments on App Store and may not check details of your question; please contact with us, we will be more than happy! With Ringabella, you are the master of your ringtones! May the Ringabella be with you!